Two ingredients are all you need to prepare this simple bread. 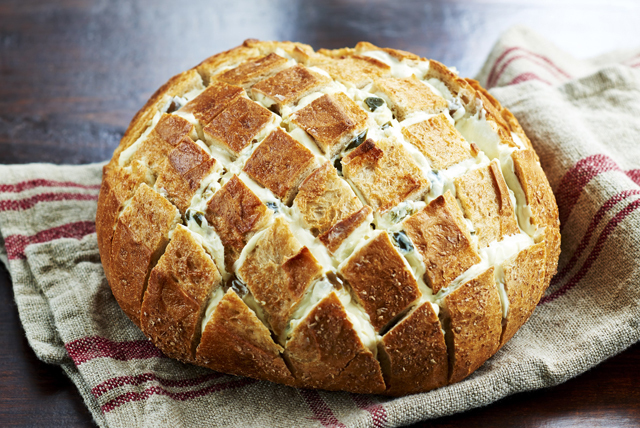 Made for pulling apart, this cheesy loaf is the ideal shareable snack. And the melted jalapeño-flavoured cream cheese makes it an irresistible recipe to serve family or friends. Cut bread into 1-inch-thick slices, being careful to not cut through to bottom of loaf. Turn loaf one half turn, then repeat cuts. Spread cream cheese product between bread pieces. Wrap in heavy-duty foil. Heat barbecue to medium-high heat. Prepare and wrap bread loaf as directed. Grill 15 min. or until bread is heated through. If you don't have heavy-duty foil, you can wrap the bread in a double layer of regular foil instead.